This appealing poster dating from 1954 is one from a series which was commissioned by the French government to highlight and promote the legendary wine-producing regions of the country. Printed in France, it is the work of French artist, illustrator and print maker, Remy Hetreau. The title is contained in a ribbon cartouche at the top of the map. 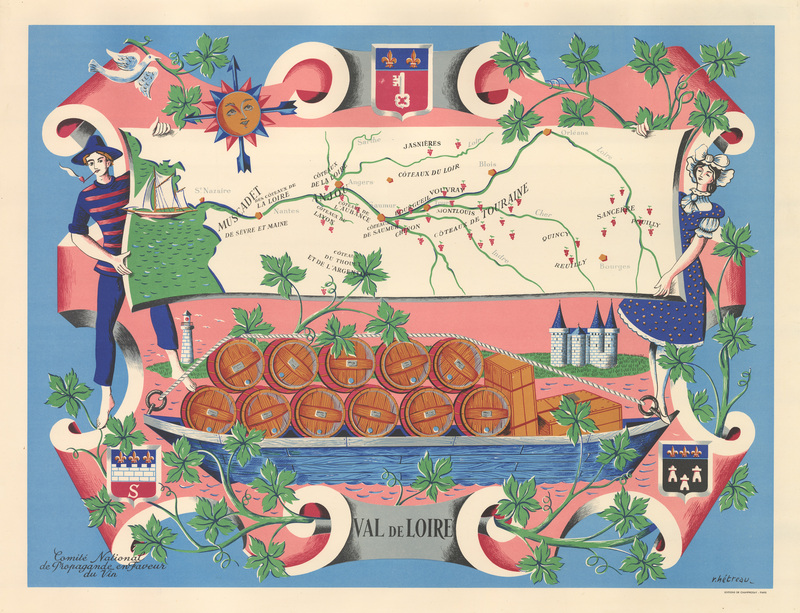 Here Hetreau presents a scroll background on which are positioned a young man and woman holding a map between them featuring the legendary Loire Valley, the region which produces some of the finest wines in the world. The sun beams brightly down on the scene, which includes a chateau, a lighthouse, a ship setting off for the high seas, and a smaller sea-going craft loaded with wine casks and boxes. Grape vines are intertwined around the edges and into the image itself, increasing the visual appeal of the poster. Three coats of arms further decorate the image. Condition: This linen-backed poster is in A condition.